Right now, Pure's Jongo music system doesn't play nicely with Spotify (unless you're connecting to a single speaker via Bluetooth), which is possibly a dealbreaker for those who don't fancy coughing up an extra amount each month to access Pure's own streaming service. But Pure is now solving that problem, announcing that you will soon be able to pump Spotify, Rdio, Deezer Pandora and a bunch of other streaming services or audio apps through multiple Jongo speakers around the house. Pure says we'll be able to enjoy "the first phase" of this new feature during Q1 2014, and hopefully we'll be able to bring you a more concrete date soon. Jongo, have you always been alone? Users will be able to stream music to one speaker via Bluetooth, which will then be sent to other speakers via Wi-Fi using Caskeid technology. Don't think that Pure Connect is going anywhere though. The iOS and Android app is still offering up a range of subscription options. It's just nice to know that a choice beyond those. In the same announcement, Pure said that it's adding a few new colour accessories too. 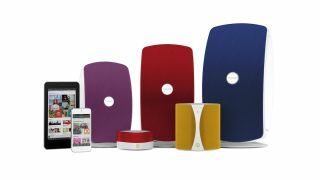 You can now personalise your speakers with a new range of colours from its 'Neutral' and 'Vibrant' ranges. Lovely stuff. So what else is going on at CES this week, then?